Fighting fire with fire—and amazing Chewbacca impersonations. Empire Strikes Bock from Daylight Blue Media on Vimeo. Lucasfilm, the Disney-owned production company in control of the Star Wars franchise, recently discovered Empire Brewing Co.’s “Strikes Bock” beer, and they weren’t happy about it. The Disney-owned giant filed a notice of opposition arguing that the beer label could water down Star Wars–themed wine sales at a Napa winery it operates called Skywalker Vineyards. Don’t worry—up until five minutes ago, we had no idea Star Wars wine existed, either. Lucasfilm says that the popular seasonal Maibock lager should not be granted a patent in advance of bottling and wider distribution, but the microbrewery says it’s been serving the beer at its brewpub for several years now, with not a peep from Lucasfilm (and definitely not a cease-and-desist). Katleski says that he hopes Lucasfilm will come to recognize the lager’s name as a parody, which is, as we all know, the sincerest form of flattery. 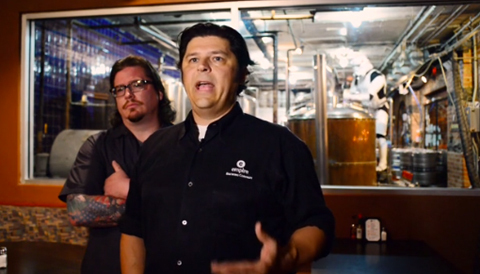 Peep the Stormtrooper working in the brewery behind them, as well as Director of Brewing Operations Tim Butler’s amazing Chewbacca impression in the video above.